One of the challenges of being in an oldline denomination is that gnawing sense that somehow we're no longer relevant. Our conversations and the inner life of our community often seems isolated from the rest of the Jesus people around us. For a community that likes to use the totally made up word "connectionalism," we often don't seem to be connected outside of ourselves. But sometimes we are connected, despite ourselves. As I listen in on the chatter both within the Presbyterian Church (USA) and without, I seem to be hearing a common theme playing out. That theme has to do with the meaning and use of the term "Universalism." Among conservative Christians both within my church and without, there's a growing hue and cry about the creeping and pernicious influence of universalism. Within my denomination the alarm is being sounded around our New Form of Government, a long overdue attempt to streamline our cumbersome Constitution. That effort is what we Presbyterians are doing to fulfill Christ's mandate to go out into the world and make significant modifications to governing documents. I think that's in Matthew somewhere. Whichever way, many conservatives are alarmed that the new text might possibly imply openness to finding truth in other faiths. Universalism! Similarly, conservative Christians outside of our fellowship are full of burn-the-hipster-witch fury at the publication of Rob Bell's latest book, Love Wins. They were cranking out the publicist-pleasing controversy before they'd even read it, but now that pre-publication book has been released, they're certain: Rob Bell is a universalist. Meaning, he's a heretic who goes past implying that non-Christians might not automatically burn in hell to actually sorta kinda saying it. This amazing conjunction of Presbyterian inside-baseball chatter and the rest of the American Christian world is striking not just because we are almost talking about the same things, but because we're all making exactly the same mistake. If you have any sense of the history of theology, the term universalism does not even come close to meaning what conservative Christianity is now claiming it means. Universalism is an old concept. It surfaced early in the life of the church, perhaps most notably in the highly creative thought of Origen, an early Christian theologian from the second and third century who was ultimately declared heretical-ish. Origen felt that God's love was so irresistable that no being, no matter how evil, could stand against it. Even the demons, Satan, and Glenn Beck would eventually be reconciled with God. That concept has resurfaced in Christianity numerous times throughout the two millenia of the faith, and bobbed up most notably in the post-Enlightenment era. In the intellectual foment and classical liberality of the 17th and 18th centuries, the idea that all peoples would be saved gathered significant steam. The radical tolerance and acceptance of other faiths that this implies still putters along amiably in Unitarian Universalist fellowships today. Now, as I've said before, I'm not a universalist. I just can't reconcile that "I'm OK, You're OK" concept with God's justice. There are things that defy God's love and grace. They will not stand in the face of God's all consuming fire. Our actions are not without ultimate consequence. But what I also can't reconcile with God's justice is this radically incorrect understanding of fundamentalist Christianity. 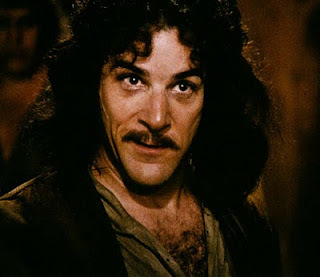 Universalism does not mean, as Inigo Montoya might say, what they think it means. Here, they're not defining universalism as everyone being ultimately OK with God no matter who they are and what they do. We're not talking about the lion and the lamb sitting down on a mossy, dew-speckled meadow in Thomas Kinkade heaven for an organic vegan picnic with Anne Frank and Hitler. In the disputes both within and outside my fellowship, universalism is being redefined by fundamentalism as refusing to say "everyone who is not a professing Christian will burn in Hell forever." It's a "hard biblical truth," they claim. "We can't step back from proclaiming the Truth, no matter how hard it is to hear," they say, nodding earnestly. But what is the truth of that truth? It is a truth that stokes the fires of hell with people whose lives are full of kindness, who are peacemakers, and who manifest the ethic that Jesus lived and taught in their words and deeds. It's a truth that defies Christ's own proclamation of the nature of the final judgment of all peoples. It is a "truth" that stands radically opposed to the love of the stranger and the other. It is a truth that assumes that God is not the font, source, and root of that love. That truth is certainly hard. But it is not hard because it is the Gospel. It hard because it is the farthest thing from good news. It's amazing the things folks will say and do when they don't really understand something.